Intel only just revealed its beefy Core i7-8086K back at the start of the week at Computex 2018, yet the anniversary edition processor has already been overclocked by an expert to hit a speed of 7.24GHz across all six of its cores. 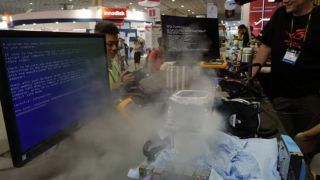 This was achieved by Der8auer (a big name in the world of overclocking) over at Computex, using the usual liquid nitrogen cooling method (chilling the chip to negative 185 degrees Celsius) to prevent the CPU from overheating or melting into an unidentifiable lump of silicon. Der8auer shows the process in a YouTube video (below) where he explained that he more or less used the same presets as when previously overclocking Intel’s 8700K, and that the new 8086K anniversary chip is essentially a “good pretest 8700K”. As Windows Latest reports, he professed the belief that he could break the record he previously set with a 7.3GHz overclock on the 8700K. Obviously 7.24GHz is pretty close to that anyway as a starting point for a first attempt, and what you have to bear in mind is that there was a far more limited selection of processors available in this case. Part of getting a record overclock is about finding a top-performing chip, as they all have slight variances (whether you get a good one with higher tolerances for overclocking is referred to as the ‘silicon lottery’), and Der8auer had a much bigger selection of 8700K CPUs to work with when he clocked up 7.3GHz. So the expectation certainly seems to be that this record will fall when he gets a proper run at overclocking the 8086K with a larger selection of chips. Part of the attraction of the Core i7-8086K is that it can hit 5GHz (via turbo) out of the box without any overclocking at all, and whether using liquid nitrogen or straightforward air cooling, this chip should be impressive when it comes to juicing it up. If you fancy chancing your arm in a competition to win one of the new 8086K chips, Intel’s sweepstakes is still open at the time of writing, and will be for the remainder of the day in the UK (or until 5pm PT in the US, which is 8pm ET). All you have to do is provide your email address to enter.